This card brings success and good fortune when it turns up in a reading. You feel assured of what you are doing. You may feel excited and full of enthusiasm for a project or venture you are working on. The Three of Wands is often associated with emigration. Once this decision was reached, it often brings relief to all those involved. Instead of wondering and worrying about things, everyone now knows where they stand. You feel positive about the future and enthusiastic about your new home and life. That’s fine you are seeking something completely different and new. You have no idea of what you might be letting yourself in for. Since, you are prepared to give it a go and take a risk; ready to open your wings and fly. This new start could involve you moving to a new location or just going on holidays. You may be in a relationship with someone of a different nationality or culture. 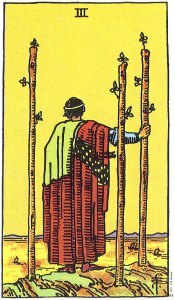 As a couple or family, The Three of Wands often suggests that you have decided to emigrate. This is bound to have been a very difficult decision to make. In a career spread the Three would suggest working overseas or looking to foreign companies for employment. This card can indicate that you are traveling in connection with work or to further your career. The Three of Wands can suggest that you are trying to expand and enter into new territory or market new products. You may have decided to test out your products on the foreign market or look to overseas for inspiration. Freedom, Movement, Spreading Your Wings, Expansion, Seeing the Big Picture, Trade, Overseas Markets, Overseas Relationship, Long Distance Relationship, Emigration.